I’m a fiscal policy wonk, so I freely acknowledge that I sometimes look at the world through green-eyeshade-colored lenses. But I don’t think it’s an exaggeration to say that expanding entitlements, changing demographics, and increasing dependency are the main long-run threats to the American economy. And this is why the concerns I had about a Hillary Clinton presidency aren’t that different from the concerns I have about a Donald Trump presidency. Simply stated, he apparently doesn’t even think there’s a problem that needs to be addressed. Here’s what Trump said in an interview with the Daily Signal. I’m not going to cut Social Security like every other Republican and I’m not going to cut Medicare or Medicaid. Some people have told me not to get too worried about this statement because candidates make so many speeches and give so many interviews that they’re bound to make mistakes and say things they don’t really mean. I agree that we shouldn’t get too hung up on every slip of the tongue on the campaign trail (notwithstanding this clip, for instance, Obama surely doesn’t think there are 57 states). But the Trump people actually re-posted the Daily Signal interview on the campaign’s website, which certainly suggests (to use legal terminology) malice and forethought on the issue of entitlements. That being said, this doesn’t mean Trump is a lost cause and that genuine entitlement reform is an impossibility. First, politicians oftentimes say things they don’t mean (remember Obama’s pledge that people could keep their doctors and their health plans if Obamacare was enacted?). Second, the plans to fix Social Security, Medicare, and Medicaid don’t involve any cuts. Instead, reformers are proposing changes that will slow the growth of outlays. Third, if Trump is even slightly serious about pushing through his big tax cut, he’ll need to have some plan to restrain overall spending to make his agenda politically viable. For what it’s worth, I’m particularly hopeful (or not un-hopeful, to be more accurate) that Trump will be willing to address Medicaid reform, ideally as part of an overall proposal to block-grant all means-tested programs. One reason for my semi-optimism is that the programs is becoming even more of a mess thanks to Obamacare and plenty of governors and state legislators would gladly accept that kind of reform simply to have more control over state budget matters. And every serious budget person in Washington understands the program must be reformed because of spiraling costs. 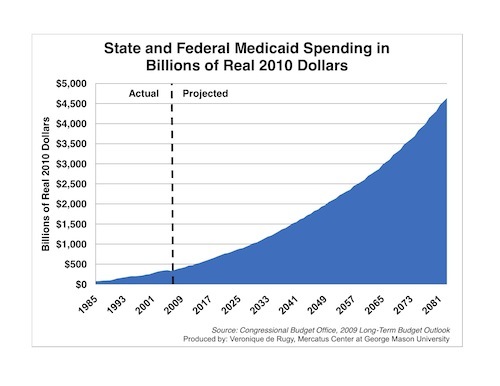 The Wall Street Journal has an editorial today about out-of-control Medicaid spending. One immediate problem is ObamaCare’s expansion of Medicaid, which has seen enrollment at least twice as high as advertised. …Governors claimed not joining would leave “free money” on the table because the feds would pick up 100% of the costs of new beneficiaries. In a new report this week for the Foundation for Government Accountability, Jonathan Ingram and Nicholas Horton tracked down the original enrollment projections by actuaries in 24 states that expanded and have since disclosed at least a year of data on the results. Some 11.5 million people now belong to ObamaCare’s new class of able-bodied enrollees, or 110% higher than the projections. Analysts in California expected only 910,000 people to sign up, but instead 3.84 million have, 322% off the projections. The situation is nearly as dire in New York, where enrollment is 276% higher than expected, and Illinois, which is up 90%. This liberal state triumvirate is particularly notable because they already ran generous welfare states long before ObamaCare. Of course, the “free money” for states is a fiscal burden for all taxpayers. It’s just that the money from taxpayers gets cycled through Washington before going to state capitals. The state spending share of new Medicaid enrollment will rise to 5% next year and then to 10% by 2020, up from 0% today. The enrollment overruns mean these states will have less to spend than they planned for every other priority, especially the least fortunate. I suppose this is a good opportunity to recycle my video on Medicaid reform. It was filmed more than five years ago, so some of the numbers are outdated (they’re worse today!). But the policy analysis is still right on point. Who knows, maybe Trump actually will do the right thing and (in a phrase he took from Reagan) make America great again. Remember, none of us expected that economic freedom would expand during Bill Clinton’s presidency, so a bit of optimism isn’t totally out-of-bounds.